Strong leads participants in Masters Strength class through a dynamic warm up. 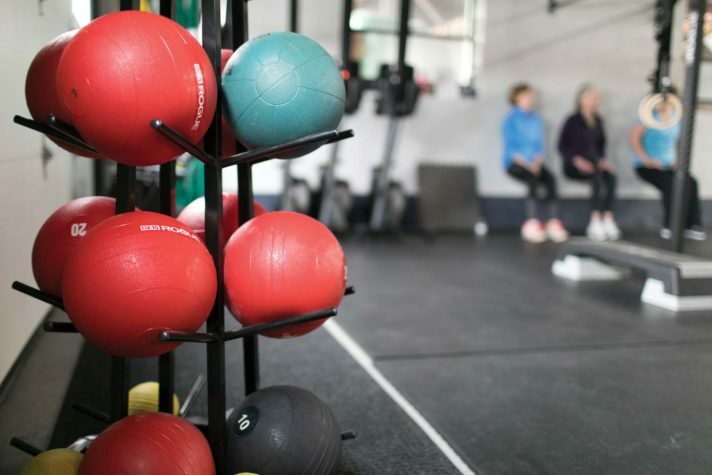 Slam balls range from ten to 30 pounds, and trainer Christina Strong uses them for a dynamic squatting activity, which involves lifting the ball high overhead, slamming it to the ground, and then squatting to pick it up. 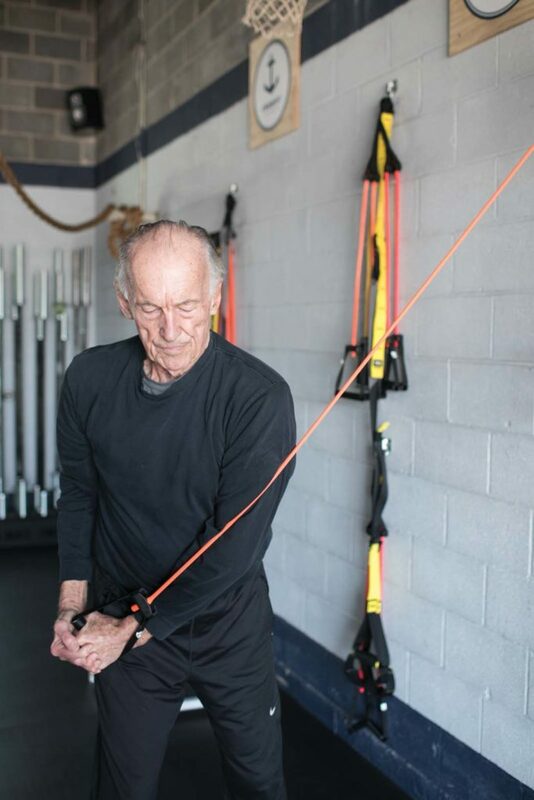 Strong offers Patty Axelsen advice on her lunge form, making sure her feet are properly aligned, and that she is using the TRX band for balance. John Kelly does a squat and then a press with a free weight. The exercise simulates going from sitting in a chair to standing up, a functional movement made a little harder by the addition of a weight. During a personal training session, John Kelly does a band rotational exercise designed to stabilize the muscles of the core. Free weights stacked in the corner of the gym. 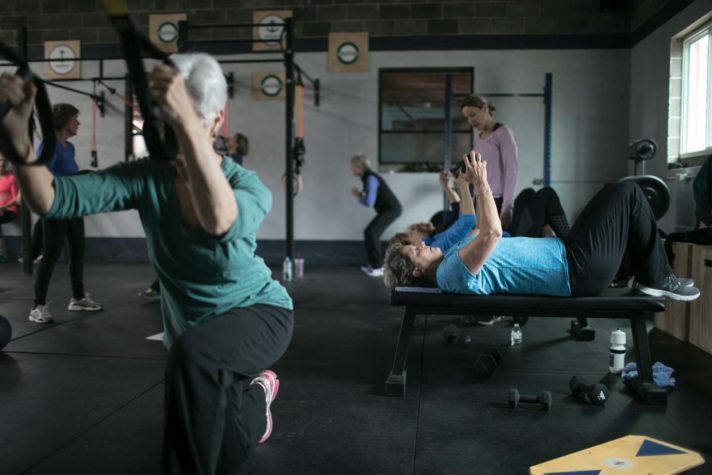 Bonny Mulholland, far left, does lunges, an exercise that strengthens her legs and invokes her core muscles, while Axelsen, center, does a bench press with a free weight that works her chest. My father had terrible osteoporosis before he died, once breaking ribs simply by turning over in bed. The disease runs on my mother’s side as well, so of course I knew I should strength train, the benefits are so widely touted. Muscle mass starts declining in one’s 30s. 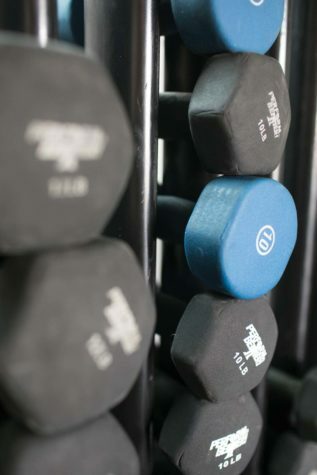 Strength training limits this decline and also helps maintain bone density, aids the efficient burning of fat, and minimizes the risk of arthritis, heart disease, and late-onset diabetes. And yet the activity has always bored me to tears. Enter Christina Strong—really her last name—and Strong Bodies, a gym located in a converted industrial garage behind Yarmouth’s former train depot. Strong is a personal trainer who also offers drop-in classes at the space she shares with CrossFit Yarmouth. One of these is Master’s Strength, a class for older adults that focuses on strength, balance, stability, and flexibility. And the good news, as one of my cohort said just last week while we were doing one-legged squats while holding a weighted ball, is that the classes are always “fun.” Strong constantly changes things up, rotating participants through seven or eight stations for one or two exercises performed in timed intervals. The classes move fast, as does Strong, a super-fit former Maine high school female athlete of the year and Division I basketball player, who is also the mother of three teenagers and the coach for the Yarmouth girls’ basketball team. At the start of each class, she quickly lays out the day’s game plan, explaining what muscle is being targeted and what constitutes good form. Then, in case you missed anything, she works the room, cheerfully reminding you what to do, correcting when needed, praising when appropriate, and looking out for anyone having trouble. Patty Axelsen, 56, found out about Strong through her orthopedic surgeon, whose wife attends Strong’s classes. In January of 2015, Axelsen fell on the ice and cracked her kneecap in four places. Two surgeries followed. For three months, she had to sit in a chair with her leg extended to promote healing. 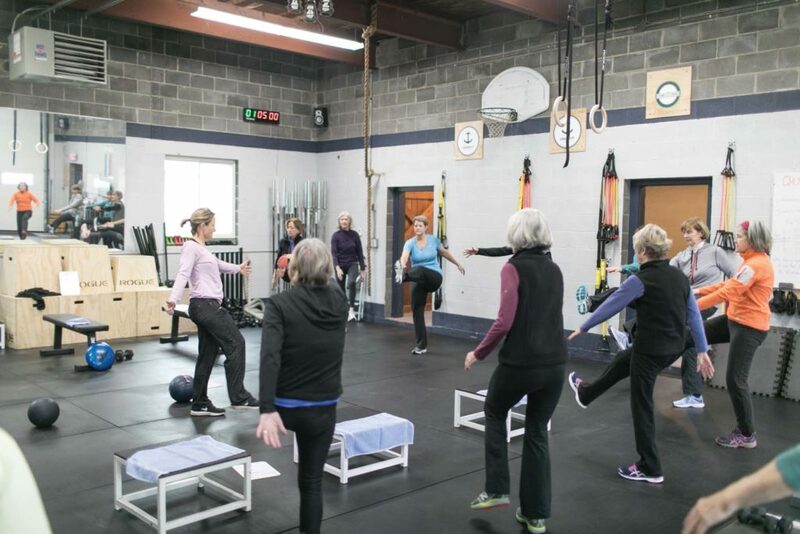 Even though she completed several rounds of physical therapy, Axelsen had lost so much strength in her injured leg that she didn’t think she could keep up with a class. 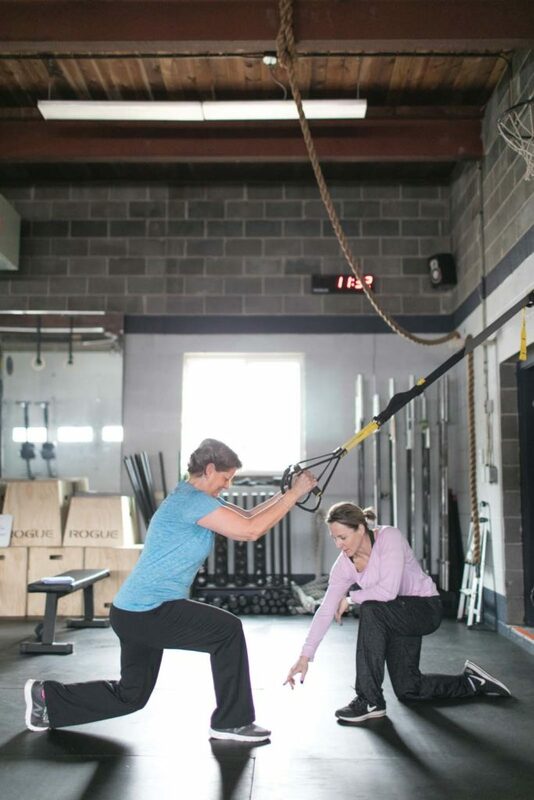 She first went to Strong for four months of personal training, then shifted to the Master’s Strength class. Axelsen’s knee injury came at a time of great turmoil in her life. A year earlier, her husband had died very suddenly of bacterial meningitis, when he was just 60. Being stronger meant she could remain in her house in Falmouth, despite being alone. It also meant she could be an active grandparent, a priority now that her stepchildren were having children. 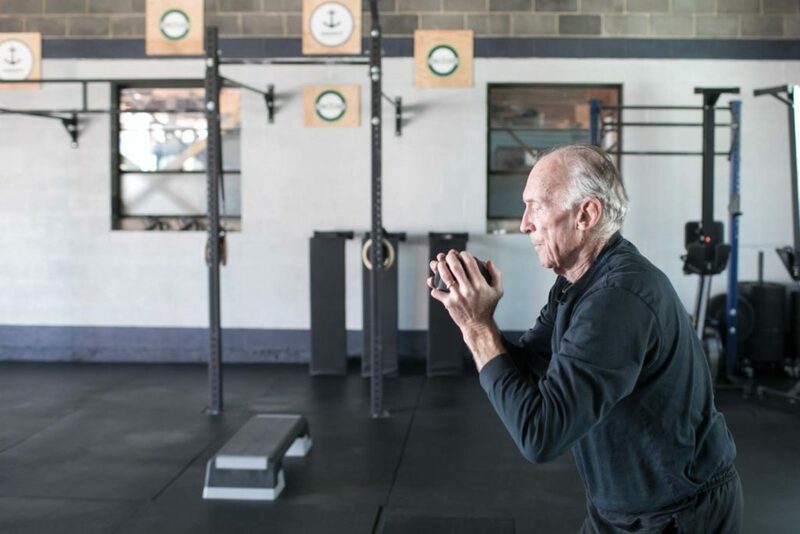 For some people, motivation can be an issue, says physician Bill Dexter of Maine Medical Partners Orthopedics and Sports Medicine. “Intuitively, people know to use it or lose it,” he says, but as with any lifestyle change, regular exercise can be challenging. What exercises should one do and how often should one strength train? Dexter recommends the American College of Sports Medicine website, as well as its offshoot website, Exercise is Medicine, for specific advice. For his older patients, Dexter is frequently focused on achievable goals. A former athlete like John Kelly might want one thing. A patient in his 90s might be simply aiming to get out of bed, go to the bathroom, and return without a fall. Bodyweight exercises and resistance bands, Dexter says, “can help people make huge strides, particularly in terms of preserving hip and leg function.” And he offers up this quite surprising fact: In later life, “you actually have more potential for improving muscle mass than you do when you are in your twenties.” You won’t get stronger at 60 than when you were younger, but there is a bigger distance from where you are before you train and where you might end up. Yet another incentive to get moving.